OP_symbol_1 : Open positions BUY or open positions SELL. Auto_Lot: Set to true to automatically calculate optimal Lot Size based on risk preferences, set to false if you want to use manual lot size. Max_Risk: Max Risk as percentage of Equity*, the greater this percentage the greater the lot size if auto lot is used. Take_Profit: Take Profit in points adjusted for 5 or 4 Digits brokers. Stop_Loss: Stop Loss in points adjusted for 5 or 4 Digits brokers. 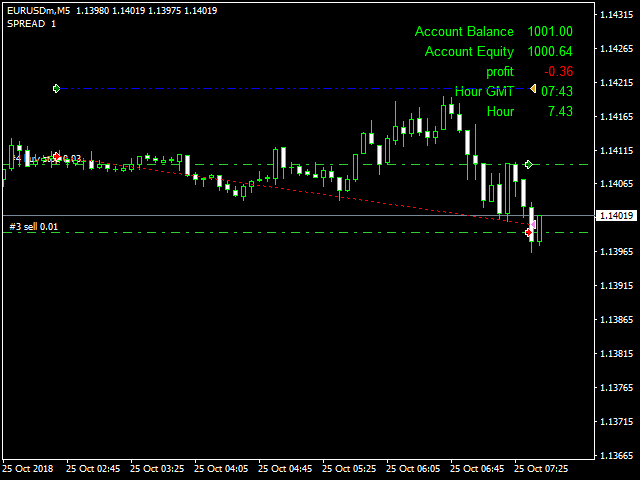 win_USD : Target profit amount for all open orders of the EA, if achieved all open orders of the EA . Start_Time: Start Time . EA starting Time. End_Time: Ending Time . EA Ending Time. Multiplication_Mode : Control the size of complications. Max_Lots : Control the maximum size of the lot. Max_SPREAD : Control the size of the spread. Step: the amount of Loss in points, if exceeded the expert will hedge an opposite position or open a new position according to signals. Works_only_once : false= working only once or true = working only once.